I love to see the tiny prairie flowers this time of year….they are so incredibly delicate-looking, but that belies their hardiness…they have to grow in the worst of soils, with a very irregular water supply…yet there they are, like tiny pools of sunshine, prettiest when conditions are harshest. 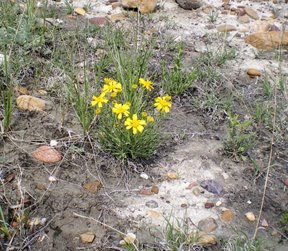 You can learn a lot from a high plains flower! This region could be called ‘the big empty’ it is filled with beauty but you have to look hard sometimes. And then, we can’t forget the ever-present Prickly Pear, the bane of the existence of every prairie crosser since Lewis and Clark, who wrote about them in their journal, and who never would have made it without the help of the Indians who had footwear that could resist the sharp spines. Prickly Pear cactus hurt worse than they look like they would. DON’T sit in one accidentally. Again, don’t ask me how I know this. They blend in so well that you don’t always see them until it is too late, and their spikes can go right through my field boots. They have some kind of compound that makes them sting a lot worse than they should, and I can still feel them a long time after I remove them from my skin. 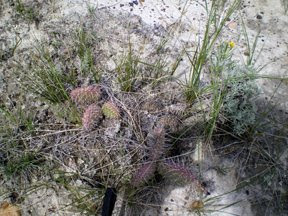 But still, when they start to bloom and those spines are topped by lacy flowers, they are beautiful. 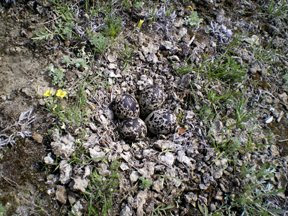 The other thing about the prairie is that because there are no trees a lot of birds nest in open ground. They rely heavily on camoflauge to keep their secrets from predators, and because they would be sitting ducks (so to speak), so the nests are untended mostly. Obviously enough of them manage to avoid being swallowed by snakes or stepped on by the zillions of cows, deer and other critters to create a new generation. Can you see them? What a way to raise your babies! Isn’t this amazing? 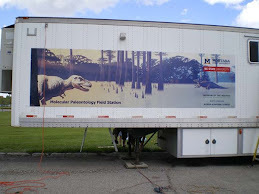 Besides the living things though, we did (well, grad student Denver Fowler did) find some hadrosaur (duck billed dinosaur) remains. They were not very convenient, located in a densely cemented sandstone lens that formed an overhang, but there was definitely skull material present. 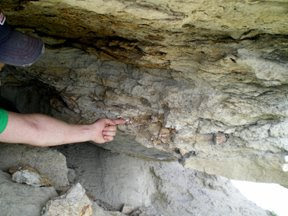 Pointing out hadrosaur bones under the overhang. That was fun, but again I don’t know if we would excavate it. Not all dinosaurs are cooperative. Well, my last night in the tent before heading back to civilization…it has been cold and wet a lot of the time here and I welcome a hot shower! That is always the best part of getting out of the field. Still as the sun sets, the birds and beasts come out to play. There is the sound of the mourning dove, haunting as it echoes across the riverbanks. And the coyotes again, singing seranades to one another, and of course, one of my favorite sounds, the deep throated ‘wooop’ of the night hawks as they dive from great heights. They are small birds, relatively, but the dive fast for their insect prey, opening their wings at the last minute to create a sound that is much more appropriate to a large bear. I am glad to fall asleep surrounded by nature. I have the world's greatest job! Things to do when it is too wet to be out quarrying. 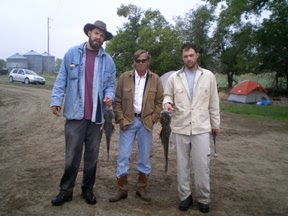 Catfish hunting onthe Milk River. And I always thought catfish were a southern thing! I will head back to town in the morning, and return again at the end of the month. I can’t wait for the next big find. Bob will ride back with me to pick up another vehicle for the field. Its always nice to have company, as this five hour drive can get pretty long. We stop in Judith Gap for a break. Remember those windmills from the way up? 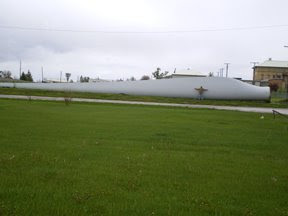 They have a single blade from one of them, just to convey how big those things really are. Bob is about 5’10, for perspective. that it can drive these things so well. See ya in a few weeks, again from the high plains of dinosaur country!